When I think eggplant, I think torta! 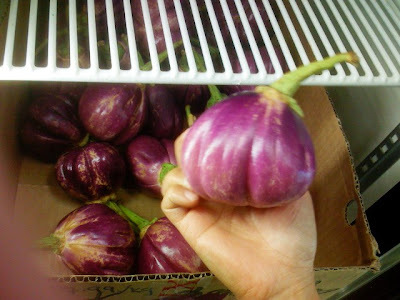 However, the eggplants here in New Zealand are a different breed. While there are elongated versions like the ones we have in the Philippines, the ones here are more green than dark violet, and the round ones are more common. My wife would usually just slice these thinly and fry, or boil it up and mash so it can be mixed with egg for torta. Boiling it, she says, is easier than grilling and removing the skin.